To succeed at freelancing you have to shoulder the responsibility of building up your own exclusive portfolio. You may be having a hard time convincing yourself of your abilities just because you are a beginner with a little expertise and experience. But few ideas can lead you into creating an exciting profile too. The most bewildering thing to answer when you are just a blooming freelancer is : How do I create an impression? While designing your unique portfolio it is essential to be expressive about your original talents and capabilities. You can expose your creativeness through your website design. Just for example, a content developer can write exceptional content for his portfolio. Graphic Designers might infuse their creative inspiration to design their own website. In simpler terms, make your portfolio a live project which exemplifies your unique talent. Let your portfolio be informative.The employer should be able to imbibe essential data from it. Showcase your abilities and strengths & subject of interest or expertise. Provide illustrations in support of your abilities. You can include samples of your original work, may or may not be from past experience. Include your personal details and some personal information about yourself. Try to include some of your personal traits which magnify your personality or make you more apt for the profession you are choosing. Being just a beginner you might not have a bulk of paid projects to reflect in your portfolio. That doesn’t mean you should refrain from highlighting your projects during your training period or during your schooling and college days. Project them and ensure it captures the attention of viewers. This will surely add up to make a win-win strategy for you. Create and spread out a handsome resource of your creativity. Giving out some of your work for no pay shall generate demand for your work and may capture an audience for you. This generosity shall pay you, provided you are keen on making it a perfect job. 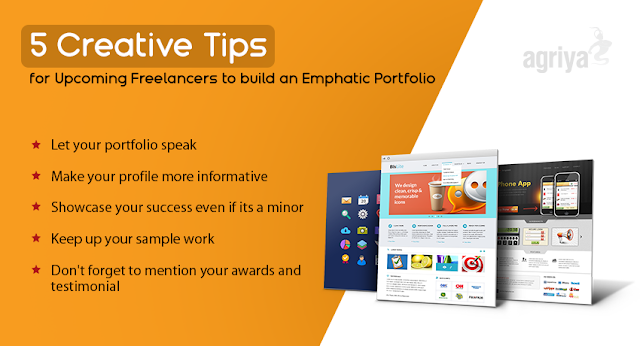 Your portfolio is the perfect ground to exhibit the best of your achievements and accolades. Make a note of your qualification details, the subjects of your interest, the achievements and accolades that you won and your projects as well as interests. The first impression lasts long! The same goes for all beginners who are willing to build their image in the freelance market with a lot of competition to beat and stand out. If you are one such beginner willing to tread through freelancing, follow these expert tips and create your exclusive success strategy.You may simply avail Agriya’s freelance portfolio script for an instant, professional & exclusive portfolio.